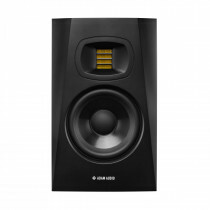 Studio monitors are the essential final link in your audio chain, ideally your monitors will provide a flat frequency response to enable you to judge your mixdown thanks to the accuracy of the audio reproduction. There are a wide range of technologies available including speakers with built in DSP (digital signal processing), basic EQ calibration and co-axial drivers as well as front and rear ported enclosures which all influence both the sound and positioning of the speaker. First up, a little about studio monitor positioning - ideally you will be able to position your monitors away from the wall to form an equilateral triangle with the refernce point (where the listener sits) behind your head. 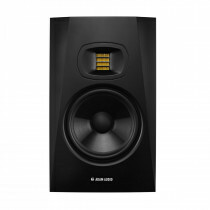 If you're planning on purchasing studio monitors with rear ports then you will need to move these further away from the wall behind them, as you move away from the wall do consider that there is a drop in bass response in the centre of most rooms which could adversely affect your perception of bass and could influence your mixing decisions. 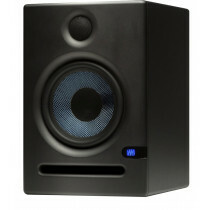 There was a period in time where both active studio monitors and the passive variety fought for supremacy but it is now generally accepted that the carefully matched amplification and crossover components compliment the driver selection in active monitors, as a result all of the studio monitors we hold in stock are of the active kind. We have monitoring solutions from KRK, Mackie, Genelec, Presonus, Pioneer Pro Audio and more with many available for free next day delivery.